Take the chill off of a tile shower's floor or bench before you even turn the water on by installing electric radiant heating. Make sure your beautiful shower feels as good as it looks. Whether you're installing a traditional tiled shower, a curbless shower, or an entire wet room, radiant heating can help make these beautiful installations feel as good as they look. Our TempZone™ Shower Mats and Shower Bench Mats are a great option for these applications. Both products are easy to install in either a tiled shower floor or a tiled shower bench. Our electric underfloor heating systems are available for a variety of floor surfaces, including tile, stone, and marble. Any room in the home can utilize our heating systems, providing comfort wherever you are. TempZone™ Shower Mats have been exclusively designed to provide warmth to a shower floor. The TempZone™ Shower Floor Mats ensure that your first step into your shower is a warm and soothing experience. The Shower Floor Mats are engineered to cover traditional shower floor areas and have taken the shower drain into consideration with a pre-cut hole to accommodate it. Each Shower Floor Mat is designed with a wire-free drain for fast and easy installation. Now that's smart. TempZone™ Shower Bench Mats have been designed to provide warmth to a shower bench and provide a luxuriant experience. Our Shower Bench Mats are installed beneath the shower bench itself so that they can efficiently radiate heat upwards. The mats are composed of electric heating elements, encased in a waterproof outer jacket, that are attached to a fiberglass mesh. The serpentine orientation of the heating wires ensure that each Shower Bench Mat delivers a consistent and even heat output of 15 watts per square foot. 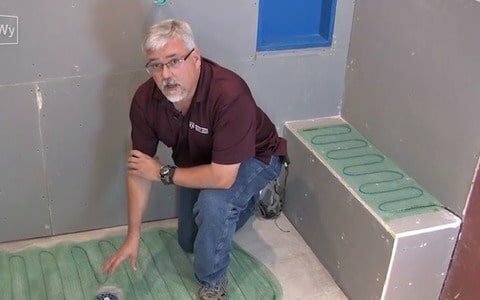 Why Install Floor Heating in the Shower? The time spent in your shower will be warm and inviting. Our products are not only efficient, but they are easy to install. Radiant floor heating is an "easy sell" in a down market. A great thermostat is the secret to any great heating system. Not only is it how you control the temperature, it’s also how you customize your comfort. When you purchase an electric floor heating system from WarmlyYours, you can choose from a selection of different controls and thermostats that will meet your specific needs. Treat yourself to a spa-like experience within the comfort of your home. Discover the benefit of warm tiles in your bathroom and don’t let your feet touch a shockingly cold tile floor. Aside from the convenience they provide, heated bathroom showers can also be a smart investment in your home. Is a Heated Bathroom a Good Investment? Take a look at our blog post to learn more about the cost and installation of a heated bathroom. Get an Instant Quote to find out how much floor heating on your bathroom will cost. Find out the estimated operating cost for your system. Provide WarmlyYours with a sketch of the bathroom shower that includes dimensions and other relevant information and you’ll receive a free SmartPlan within one business day that includes an installation plan, an electrical plan, and an itemized quote.